I already checked out the first entry – cool recipe there for biscotti that looks super good. That’s an item though I have several recipes for it in various cookbooks, I have always chickened out when it came to trying to make them. I may have to break down now and give it a try! Thanks, just went over and it looks like a great recipe!!! I tried making them once and, well, they broke up all over when I tried to cut them 🙁 Kinda discouraged me from trying it again. Maybe this one will inspire me!!! *NYC, I actually *just* took Wednesday’s recipe out of the oven and let me tell you–the smell in my house right now is AMAZING! Oh, I’m really looking forward to see your post! I’m working on mine right now! I can’t wait to see what you are cooking, erm *baking* up. I love these organised, participant friendly contests. Any chance of getting a “scratch n sniff” widget on the blog so we can smell as well as see? Just a thought. *Ilva, I’m so excited now that we’re finally ready to go! I just did my recipe this afternoon, and WOW! *Cheeky, you’re going to love it, I promise. Scratch and sniff *would* be fabulous, wouldn’t it? It’s a cold snowy day… perfect for thinking about making desserts! 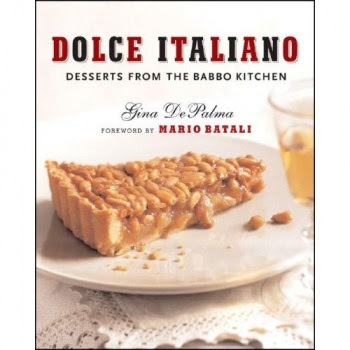 I could go for that slice of pinoli cake on the cover of Mario’s book. Strange biscotti weren’t a big item growing up in our Neoploitan/Sicilian family. Thanks for the contest!!! Italians know how to have a good time…dessert and you win something mmmmm. I made biscotti once before and it was easier then I had thought. This recipe LOOKS super YUMMY! Great idea! Now I have to get over there and comment too! This is a terrific event you all are doing! I will try to post something about it on my site. *Jen, two weeks of desserts–yeah! *AV, hope you enjoy the recipes! *Shameless, hah! You’re on to something…. *Karen, excellent point. Best of luck! *Sabine, you inspire me to finally make biscotti…. I can’t believe I almost missed this contest. I love food. I would love to win Gina’s cookbook. Please enter my name in your contest. *Plongstocking, I’m writing you now so you can comment on the correct post to be entered–only the recipe posts count!